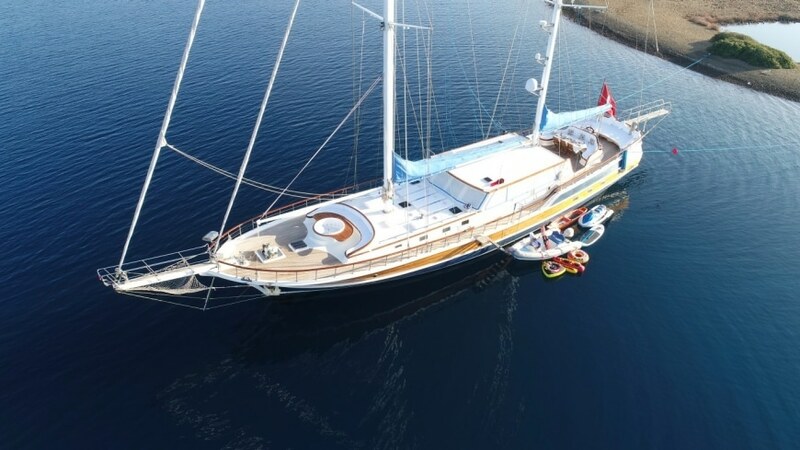 The 33m Ece Berrak gulet accommodates 10 guests in 1 master, 2 double and 2 twin cabins. Each cabin provides Satellite TV, air conditioning, and private bathrooms. The en-suites have enclosed shower, vanity, wc, and hairdryer. The layout is 1 master cabin and 2 twin cabins are aft/stern side and 2 double cabins starboard side and 4 crew cabins. The Ece Berrak gulet has a good selection of water toys for all ages including jet ski, inflatable toys, water skis, wakeboard, paddleboard, kayak and amateur fishing equipment. Lounging areas include large cushions on the aft and sun mats on the forward deck. Alfresco dining can be enjoyed on the aft. Served by a professional and experienced crew of 6 include captain, hostess, housekeeper, chef, and 2 deckhands looking forward to serving their guests on yet another blue cruise season in the Aegean and Mediterranean of Turkey and Greece. Ece Berrak yacht is a great choice for multi-family groups.